Another week has gone by . . .
« Gotta stop doing this. . .
and this is the first creative thing I’ve done since last Friday. I *have* cleared off my craft table, though, so that’s a start at least, right? Today’s sketch is brought to us by Mary Jo – it was a fun one! I love square cards, and this one was easy to throw together. There’s lots to do today before our monthly poker game tonight, so I’m going to just post and ditch today. 🙂 Everything’s pretty self-explanatory, so if you have any questions at all, please comment or email, and I’ll be happy to help. For more inspiration, visit Cami, Charmaine, Laurie, Mary Jo, and Sharon. . . . and then have a fabulous weekend! Love this! The color combo you used is not one I’d normally go for, but really is jazzin’ me! Now I’ think I’ll just have to play along! Thanks for the inspo! Beautiful card, Jenn — so “you”! Love your bright colors, those flower silhouettes, polka dots & black. Great sentiment, too! Have a good poker night and long weekend! The bright colors ROCK! LOVE it Jenn! Have a fun poker night! I hold you entirely responsible for this song playing in my head. Which I <3, but you’re still responsible. Now I’m all Christmasy!! And your card is loverly. Wow Jenn! These colors just smack of happy summer days! I love the polka dot/stamped image especially– just perfect! Well, you know these colors are right up my alley! Love this, Jenn! Enjoy poker night! Could this be any more perfect?!? WOW!! Love the color and how you worked the sketch! Love this!!! The bright colors rock!!! Fabulous! So nice bright & cheerful. Fabulous card, I love the colors!! 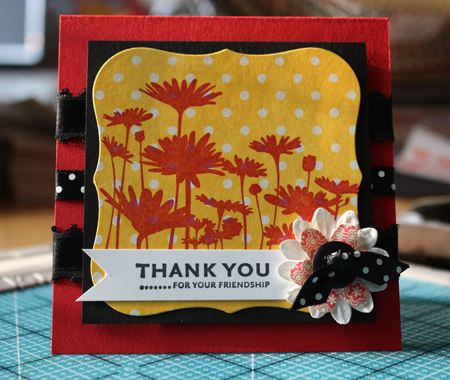 The flowers look great stamped on the yellow polka dot paper! What a great card – I love what you’ve done with this set as well as the challenge. A WOW card in my opinion! So beautifully happy and bright! Love it! Hope you’re having a wonderful weekend! I love how you stamped my fav silhouette images on the polka dot paper…and not to mention the awesome colors you have chosen to work with. Awesome job Jenn. Hope you are enjoying this holiday weekend. Ohhhh…love this card! The colors and the mix of textures and patterns work so great together! Hope you’re having a great long weekend! What fantastic bright colors! Love it!! Hope the poker goes in your favor!